I have a foreign language class for third period. It was today that I had an issue with this arrangement, or, frankly, this class in general. I’m a generally devout student; I usually enjoy attending school. As the yearly routine usually goes, a student went on the loudspeaker to honor the victims of 9/11, asking for a moment of silence from the rest of the student body. However, my teacher continued to speak over the announcement, as he was emphasizing class proceedings. Some students chuckled, for everyone in the room ignored the prompt for respects. I even laughed along with them, as ignorance can be funny. This was until two periods later — 5th period English. In class, I discovered that my teacher had to instruct class through the 9/11 attack itself, a stark contrast to a loudspeaker announcement recycled yearly. She recounted her personal horror stories from this day 17 years ago to my class. Teaching themes from an anti-war book seemed ironic to her, she had explained. On September 11, 2001, everyone in the country was afraid for their lives and man revenged against his very own kind. It, in simpler terms, was not too far off from the war literature selected for sophomore standardized reading. As I sat in 5th period, I could no longer brush aside my laughter from a few hours ago. Whatever memory I had from the moment morphed into overwhelming guilt. Ignorance, I found, is only funny when it does not disregard the lost lives of others. The men who jumped from the towers could have easily been of our fathers. And, because terrorism still prevails today, it could soon be one of us. Society, I write this because I, too, laugh at what seems as a sham. Just today, I laughed at what was perceived as a lame attempt of honor that was cast aside for 15 more seconds of academia. I realized in my 5th period class what I should have realized in my third. I found that it only takes 15 seconds to honor the lives of our fellow Americans, dying at the hands of terror, much as the soldiers that we study so zealously did in World War One. 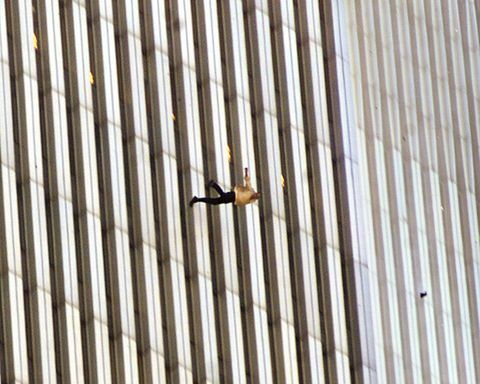 It only took 15 seconds after 9:41 a.m. for Tom Junod to take Falling Man. Dear society, all I ask is that you do not replicate my ignorant, teenage mistake and laugh at this ignorance. It is bliss, too bliss to be real. 9/11, however, was real. Too real. Thus, I beg you: let us properly honor this day, the lives of our lost Americans.